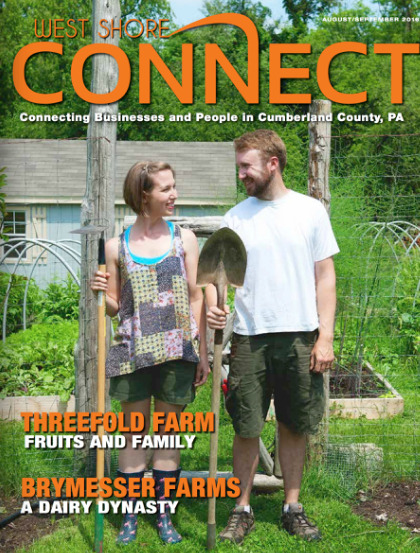 We're excited and so very thankful to have our farm featured on PennLive.com today! We gave writer Sue and photographer Sean Simmers a tour and talked about all that the farm offers as well as our grand opening this Saturday. Please check out the article! Also, enjoy a short video of our farm shot by Sue. We're excited to announce our grand opening on June 24th, 2017! We'll be open from 12pm-6pm on the 24th and will offer goat petting, face painting, and live entertainment by Dunn's American Sundries! There will be veggies and hopefully fruit for sale, Threefold Farm t-shirts, and plenty of fig trees! Check out the flyer below, plan to come, and invite your friends to this family-friendly event. If you're considering coming from out of the area, please know that we're conveniently close to the turnpike as well as routes 81, 83, and 15. We were so very honored to be featured in the August edition of West Shore Connect magazine. Check out the article on our farm and then head on over to the West Shore Connect Facebook page to check them out!